Very Positive (408) - 92% of the 408 user reviews in the last 30 days are positive. Overwhelmingly Positive (35,086) - 95% of the 35,086 user reviews for this game are positive. Publisher: Studio MDHR Entertainment Inc.
• CHARACTER SELECTION! For the first time ever, select Mugman right from the start of your adventure in single player! • FULLY ANIMATED CINEMATICS! Now, all of the game’s cutscenes play out in fabulous locomotion! • FULLY LOCALIZED TEXT IN ELEVEN ADDITIONAL LANGUAGES! In addition to English, we’re thrilled to be able to offer Cuphead in French, Italian, German, European Spanish, Latin Spanish, Brazilian Portuguese, Polish, Russian, Japanese, Korean, and Simplified Chinese. We know how long folks have been waiting for this, so we took special care in the quality of each translation, and curated fonts that felt just right for each audience. In fact, we even partnered with expert calligraphers to bring the Boss & Level title lettering to life in Korean, Chinese, and Japanese – drawing inspiration from the early cartoon works of each country! • OODLES OF BRAND NEW ANIMATION AND ART! Cuphead and Mugman have multiple fight intros! Legendary Chalice now grants Super Arts with a blast of magical energy! Mummies explode in a shower of confetti! Dozens of other dazzling additions and adjustments throughout the game! • Bug fixes and tweaks! Note: In order to bring you all of these new features and enhancements, we've had to update Cuphead to a newer version of Unity. Accordingly, this new version of Unity doesn't support DX9, so all of the new updates and forthcoming DLC will only work with this new exclusively-DX11 version of Cuphead. 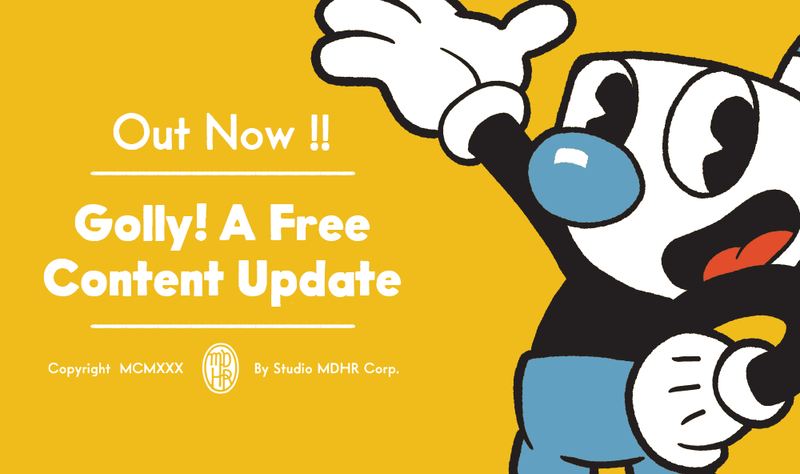 If you need to play Cuphead under DX9, we have made a DX9 branch of the game available under the Betas tab in the Properties window. By selecting "legacy- 1.1.5 DX9" version of the game, you will get the exact version of Cuphead that existed right before this new content update went live. Please note that this version will not contain any of the new Free Content Update features, nor will it work with the upcoming DLC. • Added or fixed controller compatibility with the following gamepads: Steam Controller, Xbox One Controllers connected via Bluetooth, and Nintendo Switch Pro Controller. • Please Note: For the Nintendo Switch Pro controller, you will need to enable support in Steam under Settings > Controller. • In addition, avoid syncing the Switch Pro controller if the Steam Controller is enabled at the same time, as this will cause a known conflict. To all those newly discovering the Inkwell Isles on Mac - we hope you're having a wonderful Cuphead experience! © 2017 StudioMDHR Entertainment Inc. All Rights Reserved. Cuphead™ and StudioMDHR™ are trademarks and/or registered trademarks of StudioMDHR Entertainment Inc. throughout the world. 528 Curators have reviewed this product. Click here to see them.